The mechanical properties of Teflon are low compared to those of O-ring rubber, because it is a rigid material and won’t seal well, but O-rings made of Teflon are perfect for a few applications, including paint guns and automotive steering systems. Teflon O-Rings – Allied Metrics Seals & Fasteners, Inc. The Teflon material occasionally used to produce o-rings often contains additives such as glass, carbon, graphite and bronze, which provide enhanced mechanical strength, stability and wear resistance. Using metal as filler for rubber o-rings is also utilized in reverse, since many metal o-rings have plastic elements to fill their shape out too. This practice ensures that o-rings will seal the space between two parts of a machine or pipe system to the very best of its ability. When additives are used, Teflon o-rings are valuable in a number of different applications within the automotive, medical pharmaceutical, electrical appliance and aerospace industries. Specific applications can include brake systems, hydraulic cylinders, pistons, heat exchangers and various water pumps. Although not as flexible as other types of rubber o-rings such as silicone and Viton, Teflon o-rings are still employed. O-rings made of Teflon plastic are only used in temperatures ranging from -100 to 400°F, which is considered quite limited compared to other materials. Teflon O-rings cannot be melted, so their round shape is formed through compression and sintering. Other o-ring plastics are shaped through a curing process and then heat treatments or die cutting machines. Many elastomeric O-rings are encapsulated with a covering or sleeve made of Teflon, which protects the least resistant rubber material from wear and protects it from harmful and corrosive chemicals. Teflon is inert, meaning it chemically reacts with almost no chemicals or materials, and it has a very low coefficient of friction, making it perfect for protecting from surface wear. 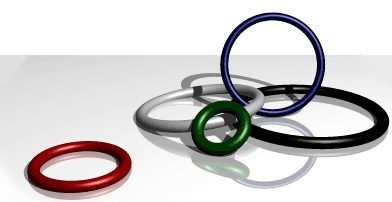 Another way to protect o-rings from deterioration, particularly when they are sealing two moving parts is lubrication. Teflon is also non-permeable, has easily uniform dimensions, is nonflammable, is able to resist high impact and doesn’t swell when exposed to temperature variation. Teflon O-Rings Teflon O-rings are made from a hard, rigid plastic with high temperature and outdoor element resistance.